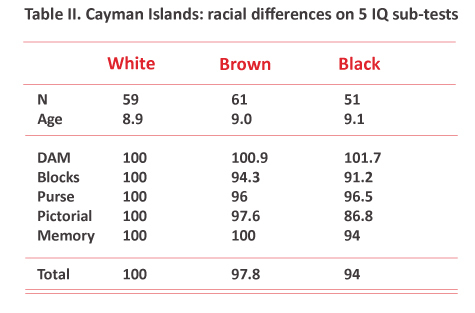 At least one psychologist has administered intelligence tests to Cayman Islands school children (1960 Curti ), and this forgotten study is noteworthy because it is also one of the relatively rare instances where black and white IQ scores have been compared outside of the United States, Britain, and South Africa. This investigation occurred before finance and tourism had transformed the territory: “… the island at the time of the study was quite isolated and all the inhabitants were living in an unusually simple environment” (p. 14). There was no regular ferry on and off the island, and the island had no newspaper, no movie theatre, and few telephones. 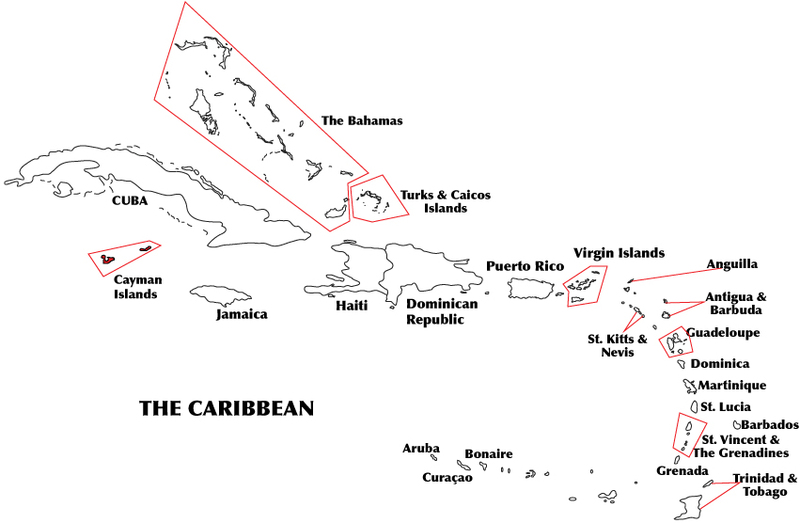 The Cayman children were tested on two separate occasions with the Goodenough Draw-a-Man test, and on one occasion with a Binet-type intelligence battery adapted for use in Jamaica. The Goodenough test allows us to compare the performance of these children with the contemporaneous U.S. norm group (Harris, 1963). Their deviation IQs are shown in Table I. * Children were classified as white, black, or mixed race (“brown”) based on skin color and hair form. The scores have been Flynn adjusted upward 1 IQ point. The first observation is that these children score very poorly. They perform worse than the retarded sample in Florence Goodenough’s original norms from 1926 (Nevertheless, the children were enthusiastic about this test, and there were no zero scores). Second, is that the white children have very low IQs. This is not unprecedented. White Anglo children from other isolated environments have exhibited similar scores (e.g. Asher, 1935; Wheeler, 1932). Third, is that blacks and browns do not score worse than whites. But the Goodenough test was administered, on the second occasion, as part of a battery, and the paper also reports data for four more sub-tests (p. 44). These scores do not have a reference group outside the Cayman Islands, so we can’t compare them against US or UK children. However we can assign the white children in this study a relative IQ of 100, and compare the scores of the black and colored children. These scores are shown in Table II. While blacks and browns performed better than whites on the Draw-a-Man test, they performed worse on the other 4 sub-tests. The full-scale IQ of the mixed race children is 3.8 points higher than the black children (B-BW gap = .25 SD). The IQ of the mixed race children is 2.2 points lower than the white children (W-BW gap = .15 SD), and the IQ of the black children is 6 points lower than the white children (W-B gap = .40 SD). 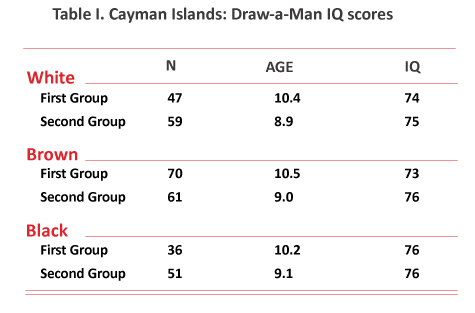 This study gives us an average IQ of 75 for 324 Cayman Island children, ages 8-12. However, this territory is no longer isolated and backwards, and economic development has probably enriched student ability. Asher, E.J. (1935). The inadequacy of current intelligence tests for testing Kentucky mountain children. The Pedagogical Seminary & Journal of Genetic Psychology, 46, 480-486. Curti, M.W. (1960). Intelligence tests of white and colored school children in Grand Cayman. Journal of Psychology, 49, 13-27. Goodenough, F.L. (1926). Measurement of intelligence by drawings. Chicago, USA: World Book Company. Wheeler, L.R. (1932). The intelligence of East Tennessee mountain children. Journal of Educational Psychology, 23, 351. I had a colleague at work with an unusual accent, kind of like Liam Neeson trying to pretend he’s American. Turned out he was a white guy from the Cayman Islands.